The Sharpe Ratio is an important tool for evaluating a stock, or a portfolio, based on how risky it is to get a higher return. You can use the Sharpe Ratio to determine how consistent the returns of a stock or portfolio are, so you can determine if the returns are stemming more from wise investing, or “getting lucky”. On the first day we track and the last day, these two investments have the same value. 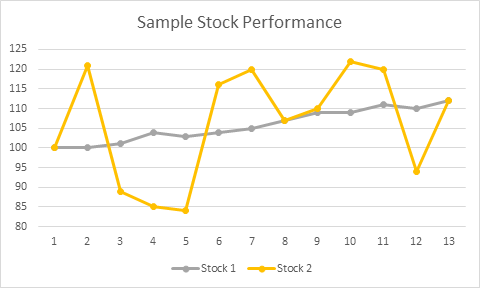 However, Stock 1 is very consistent in its returns, while Stock 2 has a very wide range of variance. In this example, if an investor holds both these stocks for 13 days, their return would be the same for both. However, imagine if the investor sold both stocks on Day 11. The return for Stock 2 would be much higher! But if they waited just one more day, on day 12 Stock 2’s value crashed down, so Stock 1 looks like a better choice. When saving and investing, the goal should always be consistent returns and capital preservation; you do not want to make risky moves that could wipe out all the savings you put in. A wise investor would always prefer Stock A, since they do not need to worry about “timing the market”, instead they can focus on building a strong long-term portfolio, instead of focusing on when to buy and sell some “hot stocks” at the best prices. In this example, Stock A would have a much higher Sharpe Ratio than Stock B, because it has much less variance for the same return at the end of the period we looked at. You can expand this concept to an entire portfolio; if your portfolio value swings up and down a lot, but you end with a higher value, you will have a much lower Sharpe Ratio than someone else who may have a lower final return, but their portfolio value grew at a more consistent rate throughout the trading period. We give contest creators the option of using the Sharpe Ratio in their contest rankings, so all contest participants can see their rankings both based on overall returns, and risk-adjusted returns. BOTH measures are very important on determining which portfolio did the “best”. A key to investing is balancing risk and reward; a Sharpe Ratio between 1 and 2 is “good”, between 2 and 3 is “Great”, and greater than 3 is “Excellent”. However, if you are comparing two portfolios with a similar Sharpe Ratio, the standard Return will tell you more about which was a wiser investment. For more advanced information about the Sharpe Ratio, and how to calculate it yourself in Excel, visit our Sharpe Ratio (Advanced) page. ← Fed Announces Interest Rate Increases This Year!